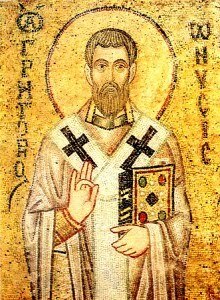 Gregory of Nyssa, also known as Gregory Nyssen (Greek: Γρηγόριος Νύσσης; c. 335 – c. 395), was bishop of Nyssa from 372 to 376 and from 378 until his death. He is venerated as a saint in Roman Catholicism, Eastern Orthodoxy, Oriental Orthodoxy, Lutheranism, and Anglicanism. Gregory, his brother Basil of Caesarea, and Gregory of Nazianzus are collectively known as the Cappadocian Fathers (Wikipedia). Gregory affirmed that in the end “No being created by God will fall outside the Kingdom of God” and that “No being will remain outside the number of the saved” (In Illud 14,21), and that “all, thanks to the union with one another, will be joined in communion with the Good, in Jesus Christ Our Lord” (On the Song of Songs XV).